For thousands of years, Turquoise has spanned all cultures, prized as a symbol of wisdom, nobility and the power of immortality. Turquoise was use in its adornment and for power, luck, and protection. 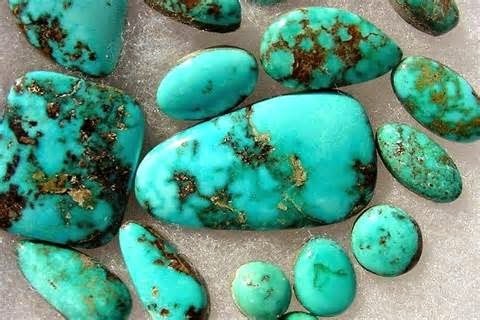 Many honored Turquoise as the universal stone, believing their minds would become one with the universe when wearing it. Because of its ability to change colors, it was used in prophesy or divining. To the prehistoric Indian, Turquoise, worn on the body or used in ceremonies always signified the god of the sky alive in the earth. Historically, Turquoise is credited with the property of securing friendly regard, verifying the traditional saying that “he, or she, who owns a Turquoise will never want for a friend.” In the Orient, a Turquoise ring was worn as a protector against all things evil. The proverb states: “Given by a loving hand it brings with it happiness and good fortune.” However, the ring emitted protective energy only if the stone was given by a friend. It was believed to restore clear vision to the mind when the thinking became muddled and thus ensured good fortune. Turquoise has always been valued as an ornamental gem, often considered a symbol of male power. Anselmus de Boot, court physician of Emperor Rudolph II, wrote in 1609 that Turquoise was so highly regarded by men that no man considered his hand to be well adorned unless he wore a fine Turquoise. Today, we know Turquoise empowers men and women equally, and worn or carried, it is a talisman of luck, success, ambition and creativity. In the workplace, Turquoise promotes leadership, assists relocation or regular travel associated with career, and helps avoid unwise investments. It helps overcome writer’s block, and is a stone of clear communication when giving information; an especially good amulet for those who work in the law, or for local or central government. 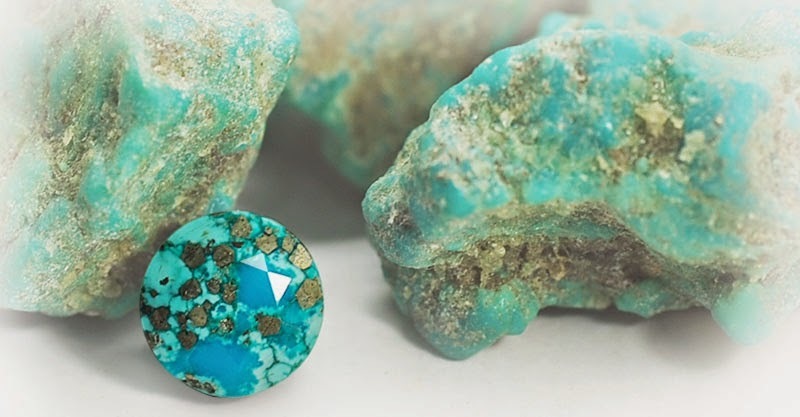 Turquoise is especially recommended for accountants and computer operators for mental relaxation, for those who work in radio or television to release anxiety, and for laborers to protect from bodily harm. As a crystal for travel, Turquoise protects you and your possessions against theft, loss or attack, helps prevent accidents, especially falls, and even guards your pet. Attached to a collar, bridle, or cage, Turquoise prevents animals from straying or being stolen, and makes horses sure-footed and obedient to their riders. Tibetan Turquoise, or Chinese Turquoise, is green and carries a slightly different vibration than the more vivid blue. It is especially useful for clearing the Throat Chakra, and blockages of suppressed self-expression. Turquoise is a stone for self-forgiveness, self-acceptance and the release of useless regrets. It encourages us to honor ourselves as a creation and a tool of the Divine. Turquoise is helpful to the respiratory system and aids in healing lung disorders and allergies. Wearing a Turquoise necklace helps prevent tracheitis and other bronchial attacks. By healing the breath, this stone may cure speech disorders such as stammering. Turquoise is a most efficient healer, providing solace for the spirit and well-being for the body.It benefits the overall mood and emotion by balancing and inducing a sense of serenity and peace. 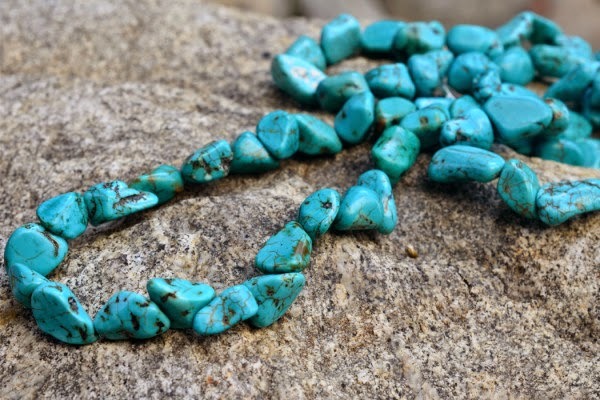 Holding or wearing Turquoise helps restore depleted vitality and lifts sagging spirits. It relieves stress and brings focus back to the center heart. It is empathetic and balancing, helping one to recognize the causes of happiness and unhappiness, and to master them. 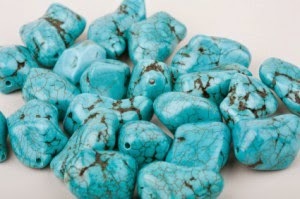 Tibetan Turquoise is an excellent anti-hysteria stone, worn to calm those with a tendency to over-react to situations. It is also beneficial for narcissism, to help one look outside their own needs and to be open to other's point of view. Turquoise strengthens the meridians of the body and the subtle energy fields, enhancing communication between the physical and spiritual worlds. Placed on the Third Eye, it supports intuition and meditation. On the Throat Chakra, it releases old vows, inhibitions, and allows the soul to express itself once more. It explores past lives and regards fate as ongoing and dependant on one's action at any moment. Turquoise is a stone for finding wholeness and truth, and communicating and manifesting those qualities. It stimulates and harmonizes the Throat Chakra, making it easier to articulate and bring forth one's deepest wisdom. Turquoise empowers those who are shy about sharing their understanding and aids in the knowledge that in speaking from the wholeness of our being, we each have something important to contribute to the collective. In traditional thought, Turquoise unites the earth and sky, bringing together male and female energies. Turquoise stimulates the initiation of romantic love, and promotes spontaneity in romantic issues. It is believed to change color to warn of impending danger or to indicate infidelity in thought or action. Spiritually, Turquoise heals and cleanses both the energy centers and the physical body. It acts to induce wisdom and understanding, and to enhance trust, kindness, and the recognition of beauty. What we wish for ourselves -- happiness, love, freedom of limitation and fear -- when extended to others by letting go of our insistence of “justice” and viewing others through compassion and forgiveness, we receive those gifts back through our own heart. Turquoise reflects the color of the world at the vernal equinox, as the blues of winter melt into the greens of spring. It is a fresh, welcome energy that moves us to serenity as new growth and life emerges. It brings hope, discovery and balance. Turquoise tempers excesses, restores calm after a storm, relieves stress, and neutralizes extremes. It helps us moderate aggressiveness and deal with rage. It brings us back to center. In lighter shades, Turquoise energy promotes inner harmony and peace through spiritual understanding. Darker, richer tones bring considerable power -- and flexibility. They counter intolerance and let us adapt to new ideas and environments.